Pep Guardiola finally completed his first match in the Premier League, with a narrow win over David Moyes’ Sunderland team. The managerial merry-go-round was struck into full swing when Sam Allardyce replaced Roy Hodgson as England manager, leaving David Moyes to take up the vacant Sunderland managerial role. With only a few weeks of pre-season preparation, expectations were not high against the favourites for the title. The teamsheet is never as expected with Guardiola as manager, and he did not disappoint with his selection on debut. Perhaps the most surprising move was the introduction of Willy Caballero in goal, instead of England & City regular Joe Hart. There was also no place for a number of City’s other big earners; Yaya Toure, Elaquim Mangala, Samir Nasri and Wilfried Bony were all left outside of the matchday squad. David Silva was moved into a slightly deeper midfield role, and Aleksandr Kolarov continued his central defensive role from pre-season. New signing John Stones completed the backline. Sunderland opted for a more conservative selection of personnel with John O’Shea deployed in central midfield alongside Jack Rodwell. Youngster Lynden Gooch was given his first Premier League start, and new signing Donald Love made his Sunderland debut at right-back. One of the most obvious tactical features utilised by Guardiola was the full-backs drifting towards the halfspace during build-up and attacking organisation. There is something to be said for irregularity. Part of the reason an unusual approach like this can be successful even without perfect implementation is a lack of familiarity from the opponent. An opposition winger spends his whole career understanding when and how to approach a wider full-back depending on a number of different reference points (such as the location of his teammates). When his man moves inside, it removes this automation and creates uncertainty – the defensive responsibility of individual players is now less certain. Particularly in the Premier League, where tactical adaptability (on a team and individual level) is less prevalent than in La Liga or the Bundesliga, slightly unusual build-up shapes have often proved successful. Brendan Rodgers & Roberto Martinez both found success with back three systems, but an inability to fine-tune these systems meant they were less successful after a period of 10-15 games. Pep Guardiola has proven his ability to understand the intricacies of a system and evaluate the problems within it. He will have no such problems. Both Gael Clichy & Bacary Sagna were more narrow than traditional full-backs, much to the amazement of the English commentary team. This was used by Guardiola many times at Bayern Munich, particularly in the latter stages of his reign in Germany, with Rafinha in particular being given increasingly complex tactical instructions. Primarily because of the positioning & dynamic movement of David Silva, City’s left-side connections were far superior and they were therefore more easily able to progress the ball on this side. During the first phase of build-up, the full-backs would drift narrow once the ball-side central defender collected possession from the goalkeeper. In the early moments of the game, this disrupted Sunderland’s defense because of their proclivity to man-orient. The ‘false’ full-back was followed by the Sunderland winger, and the vacated space was filled by either the City central midfielder or winger. This was much more successful on the left side, for a couple of reasons. Firstly, Gael Clichy’s ability to control the ball and quickly turn is superior to that of Bacary Sagna. He has improved quickness & agility over his countryman, and can pass the ball from both feet. This allows him to be less predictable when receiving the ball with back to goal, whereas Sagna would regularly turn towards his right foot. More important though was the differing approaches of David Silva & Kevin de Bruyne, and particularly how they adapted to the positioning of the full-back on their side. Silva often moved into the vacated space out wide when Clichy moved inside. Because of Silva’s natural gravity, and Sunderland’s proclivity to man-mark, this generally forced Jack Rodwell to follow him away from the central areas. The space was then opened for Nolito to make a sharp movement inside, receiving the ball in a good position to immediately attack the goal. On the other side, de Bruyne never made such a movement. The means of progessing play on the right was solely reliant on Raheem Sterling dropping deeper on the right-touchline. Because both players were facing backwards towards their own goal, the responsibility to adjust to his teammate rests with the central midfielder. 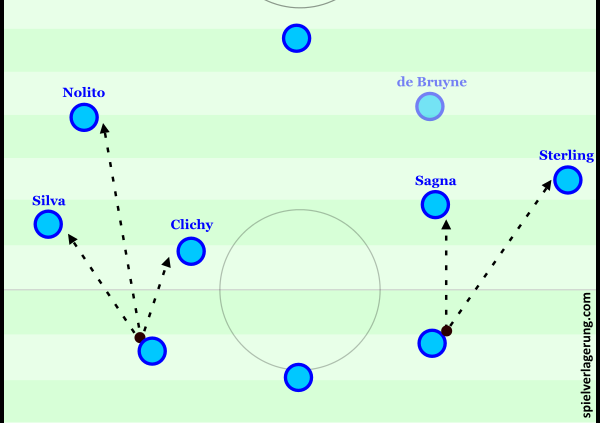 Silva successfully used the positioning of Clichy to govern his own movement, but de Bruyne seemed unwilling or unable to make similar adjustments based on Sagna’s location. 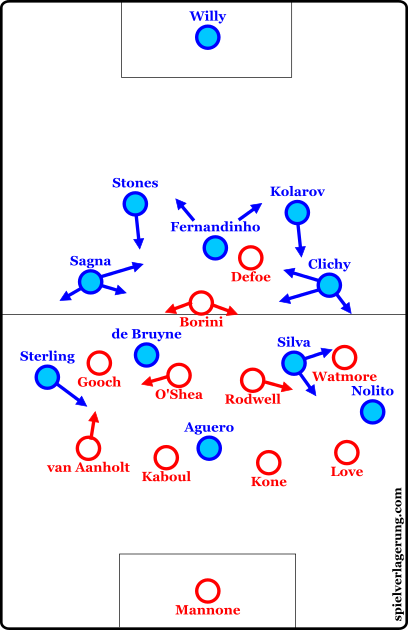 In many cases, John Stones’s options were limited as de Bruyne and Sagna would occupy the same passing lane. The main difference between City’s build-up on the sides: not only does the left-sided CB have more immediate passing options, but so does anyone that receives the ball. Of course, a similar effect could have been created if Kevin de Bruyne drifted slightly wider. This was just more organically created when the central midfielder moved deep + wide, as the forward could then make a direct movement towards goal in a more dangerous area. Even when the left-side did not make this particular movement pattern, though, Silva was more subtle in altering his positioning to ensure his passing lane was not blocked by Clichy. 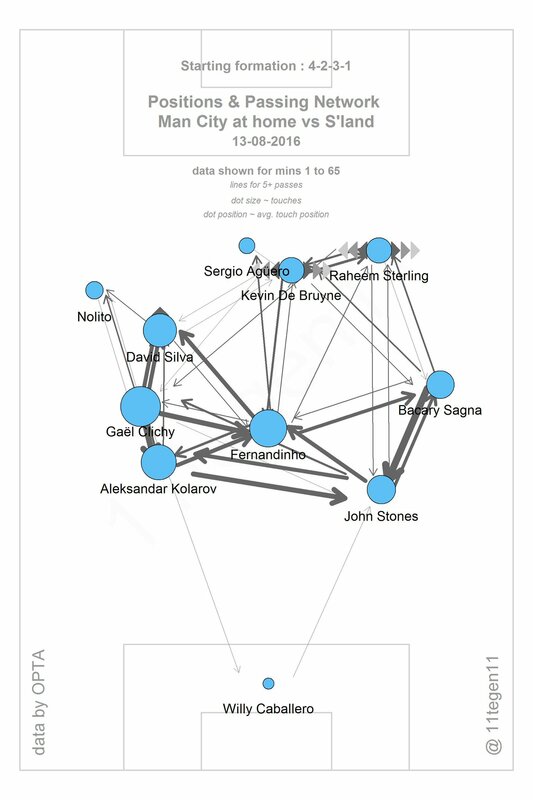 Kolarov was able to make some nice laser passes directly into Silva in advanced areas because of this. Whilst Stones’ passing influence was somewhat negated by the structure around him, he was still able to influence the game with sharp on-ball movements forward after a quick circulation in possession. Fabio Borini was often doing two players’ worth of pressing whilst Jermain Defoe stayed central, and this meant he could be fairly easily bypassed by a quick sideways pass. Stones & Kolarov both dribbled with the ball when the space was available after Borini had been forced into pressing on the other side of the pitch. Whilst the quick circulation in possession allowed the centre back to be the free-man in build-up, this effect was nullified by poor spacing from City. Sagna & Clichy seemed unaware of how to adjust their positioning, and this often led to overcrowding. Unlike David Alaba’s role at Bayern Munich, the full-backs were generally limited to the first phase of build-up, or picking up second balls. Once play moved into the final third, they merely operated as an outball to recycle possession. This allowed City to retain possession well, but did not facilitate chance creation. 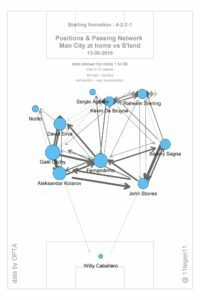 Much of City’s ability to break through came from combination play down the left between Silva & Nolito. On the right, de Bruyne was again disconnected from play and Sterling was often tasked with beating his full-back in a 1v1 duel. Later in the game, de Bruyne began to make moves towards the left to create overloads in that area, and create more space for Sterling by dragging his marker away. One of the most common transition routes in English football is the lofted pass between the central defender and advanced full-back. Jamie Vardy has made a career out of getting on the end of these passes and isolating a central defender in a wide 1v1. With a full-back positioned in a more central area, this is much more difficult to accomplish. The full-backs positioning in the halfspace gives better access for pressuring the initial passer, but also reduces the potential passing lanes the ball-player can utilise. If the pass is successful and the striker receives the ball in the wide area, the ‘false’ full-back can more easily drop into the defensive line than if he were positioned wide initially. Single pass counter-attacks are therefore much more difficult to achieve, and the opposition are usually required increased attacking presence to make an impact in transition. There is much to work on for Pep Guardiola and Manchester City, but they showed that this will not be a boring season. The team already put in a good performance, but was lacking the familiarity and understanding to consistently penetrate in the final third. its really great website, i hope you will support these great analysis with videos soon to make it even better. The premier league is a high turnover league. If Guardiola, like LVG, decides to slow the tempo to control matches he should expect teams to sit in a low block and stifle the offensive capacity of his team. Brendan Rogers and Martinez adapted their 3 at the back philosophies to PL high turnover but they conceded many goals even as they scored many themselves. Guardiola is more offensive minded than LVG so I expect his high line and experiments will be punished by the top 5 teams but he will dominate the other teams and grab similar narrow wins. With all the praise on Pep, you have to admit his lack of adaptability is a weakness. But he has never been in trouble because he always experimented in circumstances that make it hard to fail; unlike say Bielsa. I think Guardiola will “simply” try to minimise turnovers as he did at Barca and Bayern. The high number of turnovers is due to the attacking team not being capable of holding onto the ball as a team and not because there’s so much pressure (like in Bundesliga-matches) on them. Breaking down mid and low block teams has been his daily work for the last seven years and he’s particularly good at it. If he can collect the points against the teams below the top 7 as consistently as he did in Spain and Germany he might have enough to claim a title-winning spot (if he’s not losing all the others). And he’s far more likely to do so than any other coach in the game. He also showed some astonishing performances against some of the top-transitioners (Real, Atletico, BVB) in europe – who are far more proficient at counterattacking than ManUnited or Arsenal. I don’t think he lacks adaptability but is convinced that his way is the best option. Some coaches permanently adapt the strategic parts of their play whilst Guardiola keeps his strategy and adapts his tactics to every league and every opponent. This seems to be the secret of many very successful coaches throughout the ages starting at Cruyff to Guardiola, Mourinho, van Gaal, Klopp (and others) in present times. However strategically flexible coaches tend to be successful at smaller clubs (Heynckes for long times) or only in certain competitions (Ancelotti). Another point: he’s not able to adapt but experiments a lot? Could you point out how that’s possible? The line here (in England) amongst non City fans is that Pep got lucky, and it was a poor start to his life in tough-England. Clearly, he has a plan and showed his hand and it will just take time. Can’t wait to see him win the PL. Great analysis! keep up the good work. Thank you so much! Good to see that you also thought de Bruyne had a poor game, I also thought he often took too long on the ball coupled with his poor positioning. Although, the same can be said for a lot of the more advanced players; they only moved the ball at pace when they were forced too. Attempts at using quick combinations to destabilise Sunderland were few and far between. The big positive for City as you mentioned was the lack of transition opportunities that they afforded to Sunderland. It’s good to see that there is a basis for a solid defensive transition to fall back on whilst they further acclimatise to the demands of Pep’s positional play.